Club volunteer Tracy McAlpine proudly attaches her “beloved pins” to her name tag lanyard. 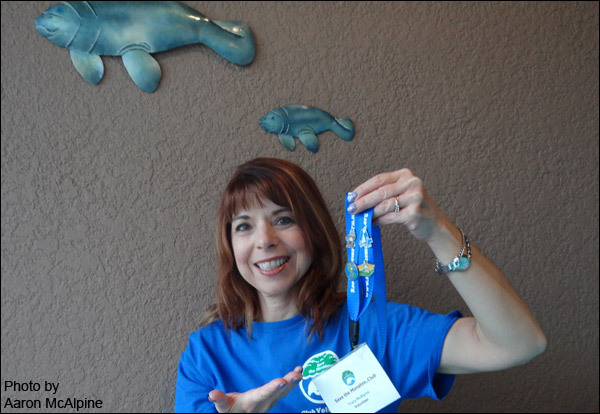 Tracy was one of many volunteers, including Tracy’s mom, Norma Kuehler, also from Hillsborough County, who received a variety of volunteer service pins from the Club, which recognizes their ongoing work and dedication on behalf of the manatees. The special, customized pins are earned by registered volunteers who staff education tables for the Club at events, help out in our Maitland office, or give manatee presentations for the Club at schools, libraries, etc. See all the pins and get more details on how to earn them as a Club volunteer at Volunteer News located on the volunteer page of our website.